File this under Spring Cleaning. This site has needed a redesign for awhile. I’m a big fan of simple and I wanted a design to reflect that. So, clinic when I found a theme called Clean Home, for sale I knew it was the one for me. It’s easy on the eyes and makes the food the center of attention. And food is what really matters here at Bitchin’ Camero. Speaking of food, I made the most delightful baked chicken the other day that I must share. I was really loving the flavors of my Spanish Collards with Chorizo, Sherry and Almonds and wanted to make it into a main dish. Of course I had more collards in my CSA box this week, so those made it into this recipe along with some baby red potatoes. 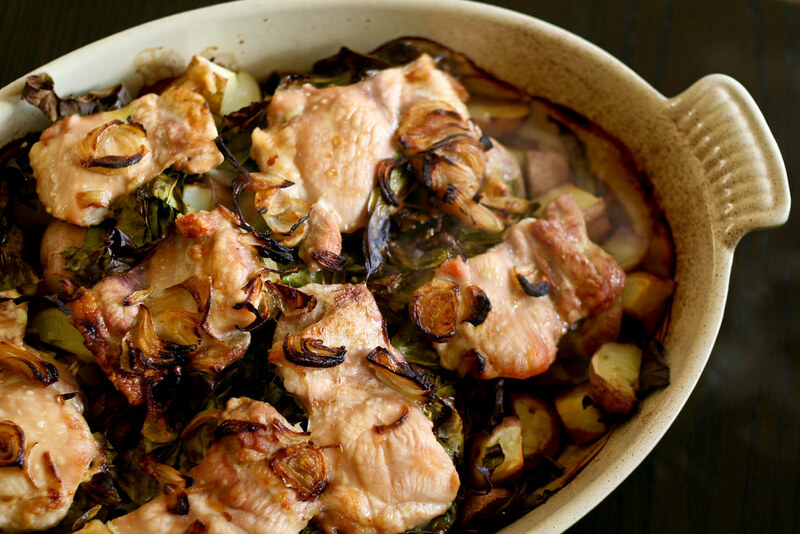 Chicken thighs, potatoes and collards were tossed with a blend of olive oil, soy sauce, sherry and shallots. Bake for 45 minutes and you’ve got this beautifully caramelized chicken with toasted shallots and creamy, sherry-flavored potatoes. It’s so very good and so very simple. Like the new site! Preheat the oven to 375°. Place the potatoes in a 9 x 13 (approx.) baking dish, then add the collards in an even layer. Whisk the olive oil, soy sauce, sherry and shallots together and toss with the chicken. 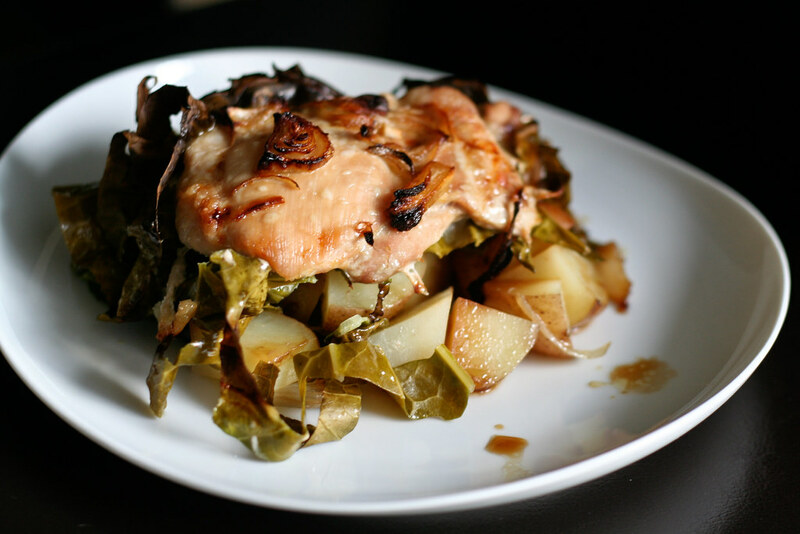 Place the chicken evenly over the collards, then drizzle with the remaining sherry sauce. Makes 4 (large) or 6 servings. I like the re-design a lot! It really helps to showcase your beautiful photos. 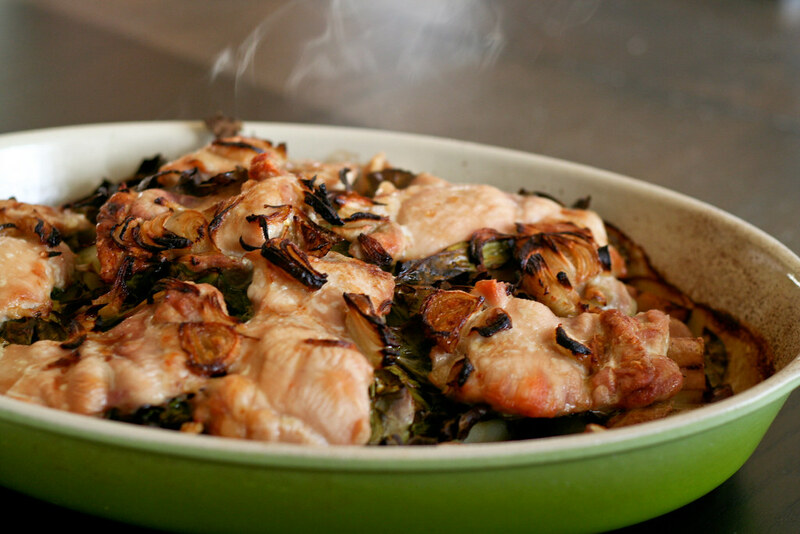 I also really like the shallot-sherry combo in this chicken dish. Very nice! The site looks great! For a second I thought I was on the wrong site :) What a beautiful chicken dish. neat new design! great idea with the baked greens. Simple and easy and beautiful and tasty. That’s what makes a perfect dish! This is a great recipe, I can’t imagine where you came up with it. Hmm, maybe you saw almost the exact same recipe last week at David Lebovitz’s site. I guess it is just a coincidence. Bob – I did see it, actually. It looks amazing – as do all of his recipes. But the idea came from the collards I made last week. And the fact that when I put “shallots” on the grocery list last week, my husband brought home 7 instead of 1 or 2, so I had a bunch in my fridge that needed using up. Great chicken dish. Wonderful photos. I have been following your blog for quite a while now and I am diggin’ the redesign. Great recipes and wonderful photos. Really love the ingredients of this dish. Great combination. This looked so delicious I had to make it tonight. It was fabulous! Another recipe to go into rotation. Question: My potatoes didn’t cook all the way. I had to scoop off the chicken and greens and cook the potatoes separately another 25 minutes to get them tender. (Full disclosure, I used almost 2 pounds of chicken boneless thighs.) Any suggestions? Either way I loved this dish and the sauce was fantastic. PetiteJ – Weird! Were they small? Like the size of home fries? Mine cooked through in the 45 minutes. I used really small ones so maybe that’s why. Maybe next time start them cooking while you prep everything else, then top them with the collards, chicken and shallots? Don’t usually have sherry in the pantry – would a dry white wine work as a substitute? Jill – It would be a different flavor, but it would most definitely work. Saw your recipe last week & tried it tonight. This goes into the rotation. Really good. I used chard because it looked the best of the store’s greens. And I mixed in sweet potatoes since I did not have enough reds – I think the mix worked pretty well. Tonight was a trial. When I cook this next, I’ll have company & will time starting the cooking for when they arrive because the aroma from the oven especially at the outset were pretty darned good. Your site & recipes are impressive. Thanks. Mel! I just recently found your website and I’m obsessed. Made this recipe last night for my lovely roommates and they loved it! I had to substitute a Malbec for the Sherry (I’m in Argentina and no Sherry here) and used spinach instead of kale but it worked out just fine. Thankssss! Besos from Argentina.